The less-known interpretation seems to dominate in Avatar. 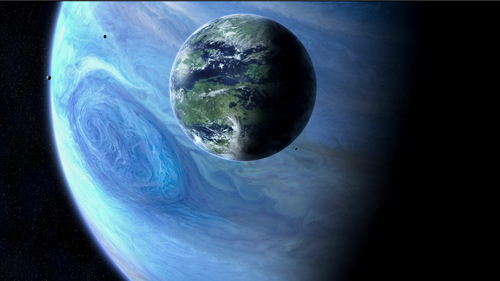 Pandora, a moon of the huge planet Polyphemus, is a lush ecosystem in which the humanoid Na’vi live in harmony with the vegetation and the lower animals they tame or hunt. Nourished by a massive tree (they are the ultimate tree-huggers), they have a balanced tribal-clan economy. Their spiritual harmony is encapsulated in the beautiful huntress Neytiri. 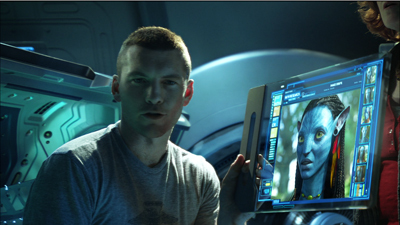 As the mate for the first Sky-Person-turned-Na’vi, Avatar Jake, she’s also an interplanetary Eve. And by joining the Na’vi on Pandora, Jake does find hope. The irony of a super-sophisticated technology carrying a modern man to a primal state goes back at least as far as Wells’ Time Machine. But the motif has a special punch in the context of the Great Digital Changeover. Digital projection promises to carry the essence of cinema to us: the movie freed from its material confines. Dirty, scratched, and faded film coiled onto warped reels, varying unpredictably from show to show (new dust, new splices) is now shucked off like a husk. Now images and sounds supposedly bloom in all their purity. The movie emerges butterfly-like, leaving the marks of dirty machines and human toil behind. As Jake returns to Eden, so does cinema. Kristin suggested the title for this series of blog entries, and I liked its punning side. For one thing, Avatar was a turning point in digital projection. 3D, as we now know, was the Trojan Horse that gave exhibitors a rationale to convert to digital. 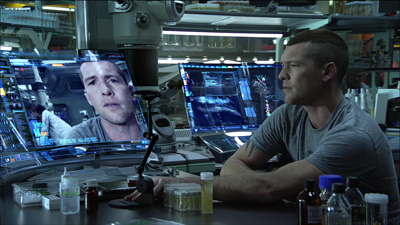 Avatar, an overwhelming merger of digital filmmaking (halfway between cartoon and live-action) and 3D digital projection, fulfilled the promise of the mid-2000s hits that had hinted at the rewards of this format. 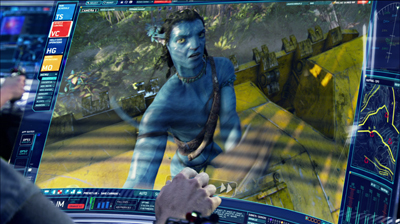 With its record $2.7 billion worldwide box office, Avatar convinced exhibitors that digital and 3D could be huge moneymakers. 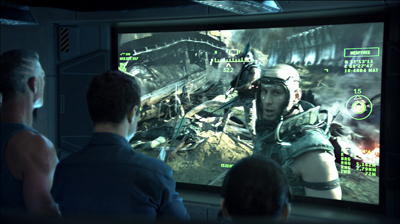 In 2009, about 16,000 theatres worldwide were digital; in 2010, after Avatar, the number jumped to 36,000. True, theatre chains also benefited from JP Morgan’s timely infusion of about half a billion dollars in financing in November 2009, a month before the film’s release. 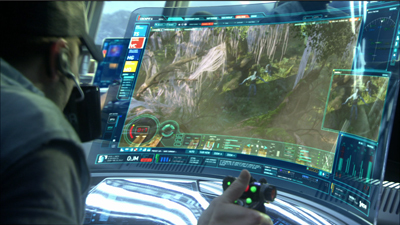 Still, this movie that criticized technology’s war on nature accelerated the appearance of a new technology. Throughout this series, I’ve tried to bring historical analysis to bear on the nature of the change. I’ve also tried not to prejudge what I found, and I’ve presented things as neutrally as I could. But I find it hard to deny that the digital changeover has hurt many things I care about. The more obvious side of my title’s pun was to suggest that digital projection released a lot of problems, which I’ve traced in earlier entries. From multiplexes to art houses, from festivals to archives, the new technical standards and business policies threaten film culture as we’ve known it. Hollywood distribution companies have gained more power, local exhibitors have lost some control, and the range of films that find theatrical screening is likely to shrink. Movies, whether made on film or digital platforms, have fewer chances of surviving for future viewers. In our transition from packaged-media technology to pay-for-service technology, parts of our film heritage that are already peripheral—current foreign-language films, experimental cinema, topical and personal documentaries, classic cinema that can’t be packaged as an Event—may move even further to the margins. Moreover, as many as eight thousand of America’s forty thousand screens may close. Their owners will not be able to afford the conversion to digital. Creative destruction, some will call it, playing down the intangible assets that community cinemas offer. But there’s also the obsolescence issue. Equipment installed today and paid for tomorrow may well turn moribund the day after tomorrow. Only the permanently well-funded can keep up with the digital churn. Perhaps unit prices will fall, or satellite and internet transmission will streamline things, but those too will cost money. In any event, there’s no reason to think that the major distributors and the internet service providers will be feeling generous to small venues. Did this Pandora’s box leave any reason to be optimistic? I haven’t any tidy conclusions to offer. Some criticisms of digital projection seem to me mistaken, just as some praise of it seems to me hype or wishful thinking. In surrendering argument to scattered observations, this final entry in our series is just a series of notes on my thinking right now. First, let’s go fussbudget. It’s not digital projection vs. celluloid projection. 35mm motion picture release prints haven’t had a celluloid base for about fifteen years. Release prints are on mylar, a polyester-based medium. Projectionists sometimes complain that mylar images aren’t as good as acetate ones. In the 1940s and 1950s, they complained about acetate too, saying that nitrate was sharper and easier to focus. In the 2000s they complained about digital intermediates too. Mostly, I tend to trust projectionists’ complaints. But acetate-based film stock is still used in shooting films, so I suppose digital vs. celluloid captures the difference if you’re talking about production. Even then, though, there’s a more radical difference. A strip of film stock creates a tangible thing, which exists like other objects in our world. “Digital,” at first referring to another sort of thing (images and sounds on tape or disk), now refers to a non-thing, an abstract configuration of ones and zeroes existing in that intangible entity we call, for simple analogy, a file. Sometimes discussion of the digital revolution gets entangled in irrelevant worries. Second pseudo-worry: “Movies are a social experience.” For some (not me), the communal experience is valuable. But nothing prevents digital screenings from being rapturous spiritual transfigurations or frenzied bacchanals. More likely, they will be just the sort of communal experiences they are now, with the usual chatting, texting, horseplay, etc. Of course, image quality and the historical sources and consequences of digital projection are something else again. It’s a good thing the pros kept pushing. Had filmmakers and cinephiles welcomed the earliest digital systems, we might have something worse. Here’s George Lucas in 2005, talking less about photographic quality than the idea of the sanitary image. The quality [of digital projection] is so much better. . . . You don’t get weave, you don’t get scratchy prints, you don’t get faded prints, you don’t get tears. . . The technology is definitely there and we projected it. I think it is very hard to tell a film that is projected digitally from a film that is projected on film. And he’s referring to the 1280-line format in which Star Wars Episode I was projected in 1999. Probably the widespread skepticism from directors and cinematographers helped push the standard to 2K. (So did the adoption of the Digital Intermediate.) Optimistic observers in the mid-2000s expected the major studios to make 4K the standard right away. Given the constraints of storage at that time, the 2K decision might be justified. But like the 24 frames-per-second frame rate of sound cinema, it was a concession to the just-good-enough camp. At the same time, George seems to grant that progress will be needed in the area of resolution. Actually, in films preserved in good state from 1901, the resolution looks just fine—better than most of what we see at the multiplex today, on film or on digital. Speaking of sound cinema: Is the changeover to talkies the best analogy for what we’re seeing now? Mostly yes, because of the sweeping nature of the transformation. No technological development since 1930 has demanded such a top-to-bottom overhaul of theatres. Assuming a modest $75,000 cost for upgrading a single auditorium, the digital conversion of US screens has cost $1.5 billion. In an important respect, though, the analogy to sound doesn’t hold good. When people went to talkies, they knew that something new had been added. The same thing happened with color and widescreen. And surely many customers noticed multi-track sound systems. But what moviegoers notice that a theatre is digital rather than analog? Many probably assume that movies come on DVDs or, as one ordinary viewer put it to me, “film tapes.” Anyhow, why should they care? There was a debate during the 2000s that audiences would pay more for a ticket to a digital screen. But that notion was abandoned. People aren’t that easy to sucker. So we’re back with 3D as the killer app, the justification for an upcharge. Whether 3D survives, dominates, or vanishes isn’t really the point. It’s served its purpose as the wedge into digital installation. By the way, according to one industry leader, 2D ticket prices are likely to go up this year while 3D prices drop. Is this flattening of the price differential a strategy to get more people to support a fading format? Mommy, when a pixel dies, does it go to heaven? Digital was sold to the creative community in part by claiming that at last the filmmaker’s vision would be respected. Every screening would present the film in all its purity, just as the director, cinematographer et al. wanted it to be seen. Jim went out to notify the staff, and two cadets came down to fiddle with the masking. The movie had already been playing in that house for several days. Maybe the masking hadn’t been changed for months? And of course the projector couldn’t be realigned on the fly. As for those pixels: There’s nothing to be done except buy a new piece of gear. Chapin Cutler of Boston Light & Sound tells me that replacing the projector’s light engine runs around $12,000. At that price, there may be a lot of dead pixels hanging around a theatre near you. Not so long ago, the difference was pitched as film versus video. That was the era of movies like The Celebration and Chuck and Buck. Then came high-definition video, which was still video but looking somewhat better (though not like film). But somehow, as if by magic, very-high-definition video, with some ability to mimic photochemical imagery, became digital cinema, or simply digital. We have to follow that usage if we want to pinpoint what we’re talking about at this point in history. But damn it, let’s remember: We are still talking about video. Ever since the days of “film vs. video,” we’ve been talking about the “film look.” What is it? I’m far from offering a good definition. There are many film looks. You have orthochromatic and panchromatic black-and-white, nitrate vs. acetate vs. mylar, two-color and three-color Technicolor, Eastman vs. Fuji, and so on. But let’s stick just with projection. Is there a general quality of film projection that differentiates it from digital displays? Some argue that flicker and the slight weaving of film in the projector are characteristic of the medium. Others point to qualities specific to photochemistry. Film has a greater color range than digital: billions of color shades rather than millions. Resolution is also different, although there’s a lot of disagreement about how different. A 35mm color negative film is said to approximate about 7000 lines of resolution, but by the time a color print is made, the display yields about 5000 lines—still a bit ahead of 4K digital. But each format has some blind spots. There’s a story that the 70mm camera negative of The Sound of Music recorded a wayward hair sticking straight out on the top of Julie Andrew’s head. It wasn’t visible in release prints of the day, but a 4K scan of the negative revealed it. Film carries more color and tone gradations than the eye can perceive. It has characteristics such as a nearly imperceptible jiggle that I suspect makes deep areas of my brain more active in interpreting it. Those characteristics somehow make the movie seem to be going on instead of simply existing. Watch fluffy clouds or a distant forest in a digital display, and you’ll see them hang there, dead as a postcard vista. In a film, clouds and trees pulsate and shift a little. 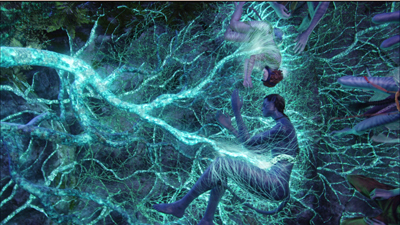 Partly the film is capturing very slight movements of them in air, or the movement of light and air around them. In addition, the film itself endows them with that “nearly imperceptible jiggle” that our visual system detects. How? Brian McKernan points out that the fixed array of pixels in a digital camera or projector creates a stable grid of image sites. But the image sites on a film frame are the sub-microscopic crystals embedded in the emulsion and activated by exposure to light. 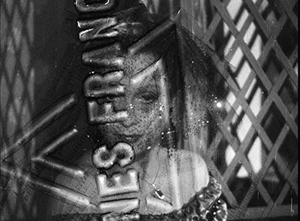 Those crystals are scattered densely throughout the film strip at random, and their arrangement varies from frame to frame. So the finest patterns of light registration tremble ever so slightly in the course of time, creating a soft pictorial vibrato. There is a certain aura in film that cannot exist in a digital image. . . . From the capture of a latent image, the micro-imperfections created by light on a perfect crystalline structure—a very three-dimensional process—to its conversion into a visible and permanent artefact, the latitude and resolution of film are incomparable to any other process available today to register moving images. For example, shadows and highlights are captured “deeply.” Bright areas move into shadow gracefully. Similarly, film is far more tolerant of overexposure than digital recording is; even blown-out areas of the negative can be recovered. (In still photography, darkroom technique allows you to “burn in” an overexposed area.) The blown-out elements are still there, but in digital they’re gone forever. Film shown on a projector maintains the film look captured on the stock: You’re just shining a light through it. We’ve all heard stories, however, of those DVD transfers that buff the image to enamel brightness and then use a software program to add grain. One archivist tells me of an early digital transfer of Sunset Blvd. that looked like it had been shot for HDTV. But today carefully done digital transfers can preserve some of the film look. When my local theatres were transitioning, I saw Tinker Tailor Soldier Spy first on film, then on digital, and then again on film. Although the digital looked a little harder, I was surprised how much graininess it preserved. So it seems to me that some qualities of the film look can be retained in digital transfers. George Lucas, at the 2005 annual convention and trade show of the National Association of Theatre Owners: “I’m sort of the digital penny that shows up every year to say, ‘Why haven’t you got these digital theatres yet? '” (Variety 17 March 2005). “His point to theater owners was that 3D, which can bring in new audiences and justify higher ticket prices, is only possible after they make the switch to digital projection” (Hollywood Reporter 10 February 2012). In summer of 1999, Godfrey Cheshire published a two-part article, “The Death of Film/ The Decay of Cinema.” It’s proven remarkably far-sighted. He predicted that within a decade your multiplex theatre would contain “a glorified version of a home video projection system.” He predicted that the rate of adoption would be held back by costs. He predicted that the changeover would mostly benefit the major distributors, and that exhibitors would have to raise ticket and concession prices to cover investments. He predicted what is now called “alternative content”—sports, concerts, highbrow drama, live events—and correctly identified it as television outside the home. He predicted the preshow attractions that advertise not only products but TV shows and pop music. He predicted what is being seriously discussed in industry circles now: letting viewers snap open their “second screen” and call, text, check email, and surf the net during the show. And he predicted that distractions and bad manners in movie theatres would drive away viewers who want to pay attention. People who want to watch serious movies that require concentration will do so at home, or perhaps in small, specialty theatres. People who want to hoot, holler, flip the bird and otherwise have a fun communal experience . . . will head down to the local enormoplex. Godfrey goes on to make provocative points about the effects of digital technology on how movies are made as well. His essay should be prime reading for everyone involved in film culture—e.g., you. I’ve mentioned the postcard effect that makes static objects just hang there. In less-than-2K digital displays, I see other artifacts, most of which I don’t know the terms for. Film has artifacts too, notably graininess, but I find the digital ones more off-putting. There’s a waterfall effect, when ripples rush down uniform surfaces. Sometimes I see diagonal striping from one corner to its opposite, an effect common on home and bar monitors. (I’m told it comes from interference from phones and the like.) On cheap DVDs, or commercial ones played on region-free machines, you can detect a weird pop-out effect, where the surfaces of different planes, usually marked by dark edge contours, detach themselves. The surfaces float up, wobbling out of alignment with their surroundings. I am not hallucinating these things. When I point them out, others see them, and then, like me, they can’t ignore them. So I’ve stopped pointing them out, especially when a friend wants to show me his (always his) fancy home theatre. Why spoil their pleasure? 1. They’re not the same, just two different media. They’re like oil painting and etching. Both can coexist as vehicles for artists’ work. 2. They’re not the same, and digital is significantly worse than film. This was common in the pre-DCI era. 3. They’re not the same, and digital is significantly better than film. Expressed most vehemently by Robert Rodriguez and with some insistence by Michael Mann. 4. They’re not the same, and digital is mostly worse, but it’s good enough for certain purposes. Espoused by low-budget filmmakers the world over. Also embraced by exhibitors in developing countries, where even 1.3K is considered an improvement over what people have been getting. 5. They’re the same. This is the view held by most audiences. But just because viewers can’t detect differences doesn’t mean that the two platforms are equally good. Digital boosters maintain that we now have very savvy moviegoers who appreciate quality in image and sound. In my experience, people don’t notice when the picture is out of focus, when the lamp is too dim, when the surround channels aren’t turned on, when speakers are broken, and when spill light from EXIT signs washes out edges of the picture. (See Chronicle anecdote above.) As long as they can hear the dialogue and can make out the image, I believe, most viewers are happy. ‘Plex operators are notoriously indifferent to such niceties. In most houses, good enough is good enough. Teenage labor can maintain only so much. I don’t trust people’s responses to such things unless the judgment is comparative. Show film and the digital program side by side and then judge. Or even show rival manufacturers’ DCI-compliant projectors side by side. I think you will see differences. As they develop, new reproductive media improve in some dimensions but degrade on others. As the engineers tell us, there’s always a trade-off. CD is more convenient than vinyl, but its clean, dry sound isn’t as “warm.” Mp3, even more convenient and portable, packs a sonic punch but is inferior in dynamics and detail to CDs. Similarly, back in the 1990s, laserdiscs had to be handled more carefully than tape cassettes, and in playback they required interruptions as sides were flipped. But aficionados accepted these drawbacks because we believed that our optical discs looked and sounded much better than VHS. One well-known professor urged that classroom screenings could now dispense with film. Now those laserdisc images would be laughed out of the room. 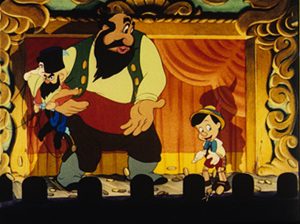 Have a look at an image from the 1995 restoration of Disney’s Pinocchio. It’s taken from a transfer of the laserdisc to DVD-R. (You can’t grab a frame directly from a laserdisc.) In this and the others, I haven’t adjusted the raw image. Actually, on a decent monitor, it looks better than this. Since you can’t grab a frame directly from a laserdisc, LD couldn’t stand up to home theatre projection today. 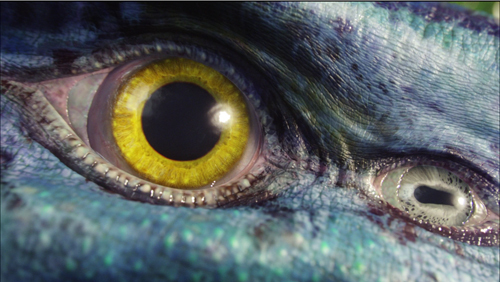 The 2009 DVD and Blu-ray (below) are sharper. Now compare the DVD with a dye-transfer Technicolor image from a 1950s 35mm print. There have been some gains and some losses in color range, shadow, and detail. For example, Stromboli’s trousers and the footlight area go very black, presumably because of the silver “key image” used for greater definition in the dye-transfer process. IB Tech restorations routinely bring out “hidden” color in such areas. Which is best? You can take your pick, but you’re better able to choose when you’re not seeing one image in isolation. Of course side-by-side comparisons can fail when most viewers don’t notice even gross differences. In a course, I once showed a 16mm print of Night of the Living Dead, and a faculty friend came to the screening. (Yes, history profs can be horror fans.) In my followup lecture, I showed clips on VHS, dubbed from a VHS master. My friend came to the class for my talk. Afterward he swore that he couldn’t tell any difference between the film and the second-generation VHS tape. This raises the fascinating question of changing perceptual frames of reference. My friend knew the film very well, and he’d watched it many times on VHS. Did he somehow see the 16 screening as just a bigger tape replay? Did none of its superiority register? Maybe not. The record continued playing, with [the contralto Christine] Miller onstage dipping in and out of it like a DJ. The audience cheered every time she stopped moving her lips and let the record sing for her. At one point the lights went out, but the music continued. The audience could not tell when Miller stopped and the playback started. 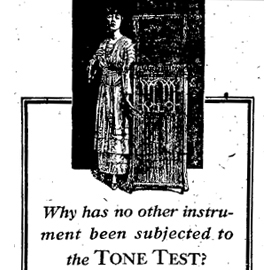 The Tone Tests toured the world. According the publicity machine run by the Wizard of Menlo Park, millions of people witnessed them and no one could unerringly distinguish the performers from their recording. Edison’s sound recording was acoustic, not electrical, and so it sounds hopelessly unrealistic to us today. (You can sample some tunes here.) And there’s some evidence, as Milner points out, that singers learned to imitate the squeezed quality of the recordings. But if the audiences were fairly regularly fooled, it suggests that our sense of what sounds, or looks, right, is both untrustworthy and changeable over history. To some extent, what’s registered in such instances aren’t perceptions but preferences. Wholly inferior recording mechanisms can be favored because of taste. How else to explain the fact that young people prefer mp3 recordings to CDs, let alone vinyl records? It’s not just the convenience; the researcher, Jonathan Berger of Stanford University, hypothesizes that they like the “sizzle” of mp3. To some extent, we should expect that people who’ve watched DVDs from babyhood onward take the scrubbed, hard-edge imagery of video as the way that movies are supposed to look. Or perhaps still younger people prefer the rawer images they see on Web videos. Do they then see an Imax 70mm screening as just blown-up YouTube? 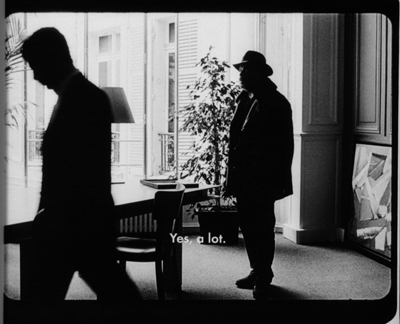 Godard’s Éloge de l’amour: DVD framing vs. original 35mm framing. Digital projection is already making distributors reluctant to rent films from their libraries, and film archives are likely to restrict circulation of their prints. 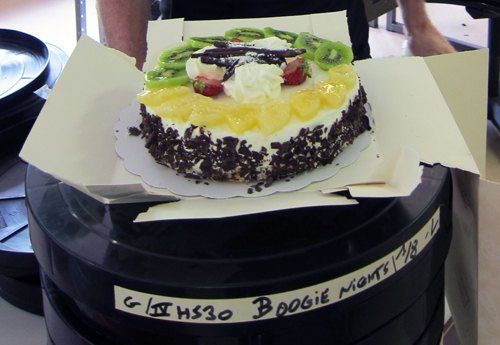 When 35mm prints are unavailable, it will be difficult for us to perform certain kinds of film analysis. In order to discover things about staging, lighting, color, and cutting in films that originated on film, scholars have in the past worked directly with prints. For example, I count frames to determine editing rhythms, and working from a digital copy isn’t reliable for such matters. True, fewer than a dozen people in the world probably care about counting frames, so this seems like a trivial problem. But analysts also need to freeze a scene on an exact frame. For live-action film, that’s a record of an actual instant during shooting, a slice of time that really existed and serves to encapsulate something about a character, the situation, or the spatial dynamics of the scene. (Many examples here.) This is why my books, including the recent edition of Planet Hong Kong, rely almost entirely on frame grabs from 35mm prints. Paolo Cherchi Usai suggests that for every shot there is an “epiphanic frame,” an instant that encapsulates the expressive force of that shot. Working with a film print, you can find it. On video, not necessarily. Just as important, for films originating in 35mm, we can’t assume that a video copy will respect the color values or aspect ratio of the original. 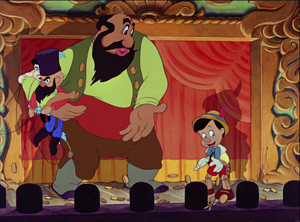 Often the only version available for study will be a DVD with adjusted color (see Pinocchio above) and in a different ratio. I’ve written enough about variations in aspect ratios in Godard and Lang (here and here) to suggest that we need to be able to go back to 35mm for study purposes, at least for photographically-generated films. For digitally-originated films, researchers ought to be able to go back to the DCP as released, but that will be nearly impossible. I began this series after realizing that in Madison I was living in a hothouse. As of this fall, apart from festival projections on DigiBeta or HDCam, I hadn’t seen more than a dozen digital commercial screenings in my life, and I think nearly all were 3D. Between film festivals, our Cinematheque, and screenings in our local movie houses, I was watching 35mm throughout 2011, the year of the big shift. But now I’ve woken up. We all conduct our educations in public, I suppose, but preparing this series has taught me a lot. I still don’t know as much as I’d like to, but at least, I now appreciate the riches around me. I’m very lucky. It’s not over, either. The good news is that the future can’t really be predicted. Like everybody else, I need to adjust to what our digital Pandora has turned loose. But we can still hold on to hope. This is the final entry in a series on digital film distribution and exhibition. On the Pandora perplex, see Dora and Erwin Panofsky, Pandora’s Box: The Changing Aspects of a Mythical Symbol (Princeton University Press, 1956). The Wikipedia article on the lady is also admirably detailed. 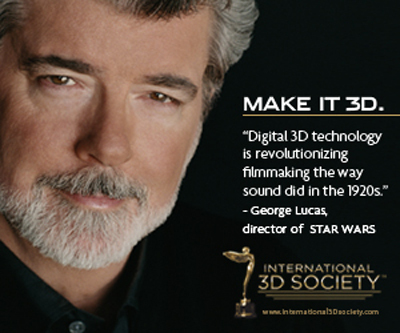 Brian McKernan’s Digital Cinema: The Revolution in Cinematography, Postproduction, and Distribution (MGraw-Hill, 2005) is the source of two of my quotations from George Lucas (pp. 31, 33) and some ideas about the film look (p. 67). My quotation from Greg Milner on the Tone Test comes from his Perfecting Sound Forever: An Aural History of Recorded Music (Faber, 2009), 5. NPR recently broadcast a discussion of the differences, both acoustic and perceptual, among consumer audio formats. The show includes A/B comparisons. Thanks to Jeff Smith for the tip. Thanks to Chapin Cutler, Jeff Roth, and Andrea Comiskey, who prepared the projector map of downtown Madison and the east end of the campus. 6 February 2012: This series has aroused some valuable commentary around the Net, just as more journalists are picking up on the broad story of how the conversion is working. Leah Churner has published a useful piece in the Village Voice on digital projection, and Lincoln Spector has posted three essays at his blogsite, the last entry offering some suggestions about how to preserve both film-based and digital-originated material. Tinker Tailor Soldier Spy has to be counted a success ($64 million worldwide so far), and it may have brought new attention to John le Carré’s writing. The fact that some websites and Twitter feeds lured readers to my entry on the film (and thanks to all) suggests that people can enjoy a film even though major aspects of the plot escape them. Everybody loves a mystery, right? Regular readers won’t be surprised to learn that I had originally written something longer about le Carré’s narrative strategies generally. Out of common human decency I cut the entry in half and focused on the film. But seeing the interest in what I’d posted, I thought that there might be enough hard-core readers who’d want to go down the rabbit hole again. During the 1970s le Carré seems to me to have reinvented the dense, almost digressive plotting we associate with the nineteenth century British novel. A little narrative theory helps us understand his ongoing exploration of storytelling technique. We’re used to thinking that a plot presents one or two major characters moving through the world. That movement yields adventures in the broadest sense: encounters with others, experiences that illuminate some aspect of life, conflicts both inner and outer. Our mental prototype of a plot, certainly in mainstream films, features a protagonist (or a couple) accompanied by lesser figures who become allies, helpers, lovers, rivals, and enemies. Le Carré’s first novels accord with our prototype, with the addition of those old standbys Mystery And Intrigue. Call for the Dead (1961) and A Murder of Quality (1962) are mostly straightforward detective stories. Although George Smiley is a secret agent, he’s forced to investigate crimes. Accordingly, he goes from place to place, suspect to suspect, and hears out their explanations and alibis. With The Spy Who Came in from the Cold (1963), le Carré moves closer to an adventure plot, as we follow a protagonist in a linear succession of encounters. As is common in the genre, concealed information is sprung on us at various points, forcing us to recast what we thought we knew. It takes a mind as odd as that of Viktor Shklovsky, the great literary theorist, to point out that we can think of any longish narrative as the intersection among many stories. He believed that as a form the novel developed out of assemblies of shorter tales. He pointed to The 1001 Arabian Nights and The Decameron as examples of this sort of compilation—long works built out of collected stories, enclosed within a bigger storytelling situation. When the novel became a distinct genre, Shklovsky thought, it continued this tradition. In essence, each novel makes a long story out of several shorter stories. But unlike what happens in the compilation format, the stories become connected to one another. Character A figures not only in her own plot, but in Character B’s. This tends to hide the fact that separate stories are nestled within the overall architecture. Besides connecting all the sub-stories, the ordinary novel makes some of them very minor. Our simpler prototype relies on suppressing or compressing all the other story lines except the one involving the protagonist. Our protagonist meets lots of people, but some are given no background, others a bit, and still others a fair amount, but nobody’s story can override the hero’s. Shklovsky asks us to rethink our idea of the standard novel. It becomes not a straight-line path but a tangle of virtual tales that has been radically chopped down and ironed out. All the latent stories might be intriguing enough to sustain a plot in themselves, but for immediate purposes they must be subordinated to the fate of those creatures we call protagonists. In effect, Shklovsky suggests that every narrative can be thought of as an undernourished network narrative. In a tale of mystery and detection of course, hidden backstories of some of the characters come to light gradually. But severe selectivity still reigns, because the backstories bear on the protagonist’s main goal: solving the mystery. When Smiley cracks a murder case or agent Leamas realizes that he has been deceived by his superiors, we understand other characters’ lives in a new way, but they don’t steal the stage from our hero. Still, Shklovsky notes, some storytellers have realized that secondary characters can claim the spotlight as well. At the limit, they can furnish new narratives, as in Wicked and Rosencrantz and Guildenstern Are Dead. Henry Jenkins’ idea of transmedia storytelling exemplifies this idea: the ally in one tale can become the hero of another, perhaps on another media platform. But of course nineteenth-century novelists aimed to do the same thing within a single tale, building elaborate plots that would give us an ample sense of how the lives of many characters converge through chance or common purpose. Our Mutual Friend, Pot-Bouille, and War and Peace try to accommodate a great many stories within their wide compass. I think that with the novel Tinker, Tailor le Carré decided to try this option, to give the spy novel—typically the province of the teasing linear plot exemplified in The Spy Who Came in from the Cold—the sense of a panorama surveying many characters’ lives and perspectives and, still more broadly, the institutions that they serve. But there’s a problem here: How to expand your plot to do justice to many characters’ backstories and sidestories? Again Shklovsky provides useful hints, and le Carré tried many of the options he proposes. Shklovsky suggests that stories can be integrated in two basic ways. One is through framing. You the writer set a self-contained tale, or several tales, inside a bigger one. This is exemplified by The Decameron and The Canterbury Tales, as in the films that Pasolini made from these classic works. We can see this option at work in a movie like Dead of Night (1945), in which guests at a country house party swap stories of the morbid and bizarre. Actually, le Carré tried this. The Secret Pilgrim (1990), is virtually a collection of short stories framed by an aged spy listening to Smiley lecture at MI6’s training school. Another option is what Shklovsky calls “threading,” the principle that traces the consecutive adventures of a protagonist. This is the prototype I’ve already mentioned. But Shklovsky suggests that by keeping the protagonist thread you can still expand the framed tales. In Don Quixote, the adventures of the Knight and Sancho Panza hold their own interest, but they surround a string of embedded tales told by the people they meet. And sometimes those embedded tales are pretty long. It seems to me that le Carré sought ways in which he could expand his embedded tales without losing the main thread. For example, his novel following The Spy…, The Looking Glass War (1965), splits the protagonist function up into three characters, their parallelism stressed by the section titles: “Taylor’s Run,” “Avery’s Run,” and “Leiser’s Run.” There is an overarching rhythm to the action, but we have three distinct protagonists. It’s as if the author is rehearsing, on a smaller scale, the shifting viewpoints that he will exploit in his longer fictions. The tripled protagonist also allows le Carré to present different standpoints on that center of spying operations MI 6, known as the Circus. The following book, A Small Town in Germany (1968), is a return to a single protagonist and a straight detective plot, but now the mystery focuses on the bureaucracy behind espionage. Alan Turner, an embittered spy in the Leamas mold, is searching not only for a staff member missing from the British embassy in Bonn but also for some damaging files that have vanished. The drab routines of sorting, checking, and managing information become the object of scrutiny, and Her Majesty’s civil servants are prime suspects. Le Carré had found a way to put burrowing at the center of his plot. After these efforts, in which Smiley barely appears, le Carré might well have felt ready to test his talents on a broader canvas. First came The Naïve and Sentimental Lover (1971), a satiric psychological novel about a businessman who becomes entranced by a novelist and his wife. The book, which runs over 400 pages, shows le Carré’s eagerness to stretch out. Just as important, I suspect, is its value as a laboratory for narrative experiments. Descriptions swell, and inner states are reported in detail. Instead of a roaming point of view, there are deep plunges into the main character’s mind and senses through stream of consciousness, free indirect discourse, and a curiously omniscient voice, sometimes pitying and sometimes jocular. Compare the driving scenes in the opening lines of two books. “I’ll be all right,” said Cork, the Albino coding clerk, and looked anxiously at the older man in the driving seat beside him. Cassidy drove contentedly through the evening sunlight, his face as close to the windshield as the safety belt allowed, his foot alternating diffidently between accelerator and brake as he scanned the narrow lane for unseen hazards. Beside him on the passenger seat, carefully folded into a plastic envelope, lay an Ordnance Survey map of central Somerset. . . . For the attention of Mr. Aldo Cassidy ran the deferential inscription; for Aldo was his first name. He drove, as always, with the greatest concentration, and now and then he hummed to himself with that furtive sincerity common to the tone-deaf. The style seems to me unsure, but clearly the writer is moving beyond terseness toward something more enveloping and commentative. Returning to the espionage genre, le Carré hit upon another way to fill a big canvas. He resurrected that old formula, the supreme master-mind criminal pitted against our beleagured hero. The master spy isn’t Mabuse or Fu Manchu but the Russian Karla, snug in Kremlin Centre, and George Smiley’s efforts to flush him out are chronicled in Tinker, Tailor, Soldier, Spy (1974), The Honourable Schoolboy (1977), and Smiley’s People (1979). The mass-market omnibus edition of these runs to nearly a thousand densely packed pages. How did our author manage plots on this new scale? Chekhov says that if a story tells us that there is a gun on the wall, then subsequently that gun ought to shoot. . . In a mystery novel, however, the gun that hangs on the wall does not fire. Another gun shoots instead. Some expansions are pretty evident. The Quest for Karla trilogy introduces many new characters, mostly people who staff the Circus or who are involved with the institution of espionage: from secretaries and “scalphunters,” the lonely and low-down agents assigned to menial bits of spying, to the very top, such as the Minister who oversees MI6 and Lacon the pliant civil servant overseeing the Circus. Some of these characters are in turn given private lives, with friends and lovers. The connections ramify. In addition, there are the civilians whose lives are touched by the Cold War chessgame. In The Spy Who Came in from the Cold, that demographic was represented by Liz Gold, Leamas’ lover. But in the Karla trilogy we get a panoply of more or less innocent figures who are pulled into webs of plot and counterplot. And here le Carré does something quite shrewd. He tends to start the novel with these characters, people at the very edge of the web. Smiley’s People opens with an unassuming Russian émigrée living in Paris. She’s confronted by a Soviet agent telling her she might be permitted to see her long-lost daughter. What does that have to do with Smiley’s cleaning the Circus stables after the mole scandal, or Smiley’s loss of power after the Jerry Westerby misadventure? Positing enigmas at two or three degrees of separation, working inward across the web, le Carré lets the reader gradually sense the lines of force that lead inexorably to the principals. So le Carré grows his book not merely by expanding his cast. He finds a new balance between thread structure and framed stories. 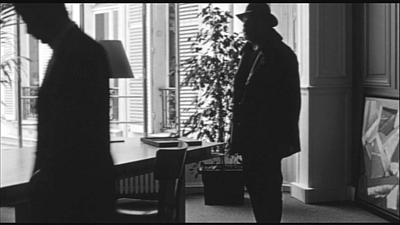 In Smiley’s People, perhaps the most orthodox entry in the trilogy, Smiley investigates the death of an émigré Soviet general, and this entails a fairly standard detective plot. The novelty comes in the fact that the participants Smiley questions are former agents whom he ran, or colleagues retired from the Circus—his people. And what they tell him isn’t rendered in compressed dialogue or summary. Their recollections spread out luxuriantly, claiming considerable interest in their own right, sometimes with only slight points of contact with the main plot, sometimes burying clues that Smiley must dig out. More intricate is The Honourable Schoolboy, the longest entry in the Karla trilogy. It has two main threads: Jerry Westerby’s efforts to trace money flowing from Moscow to Hong Kong, and Smiley’s struggle to rebuild the Circus. The plot encapsulates the two main types of spy fiction—indeed, the two types that le Carré had already mastered in his earlier books. While Jerry’s plot is suspenseful adventure stuff, Smiley’s plot is inquiry-oriented, like that in Ambler’s classic Mask of Dimitrios (1939). To stretch the canvas on a still bigger frame, le Carré makes Smiley pass investigative assignments to other Circus personnel, like Connie Sachs and Doc di Salis (who get characterized in detail). Indeed, both main lines of action are filled out with rich and lengthy sub-stories. We can study the tradecraft of old Craw, majestic spy-journalist; the puzzling past of Lizzie Worthington, Drake Ko’s mistress; and the enigmas around her lover Ricardo, either dead or flying heedlessly through an Asia in flames. The Honourable Schoolboy also has a more layered narration than its predecessors. It switches point of view constantly, in the process virtually promoting Peter Guillam to the rank of Smiley’s Watson. Most striking is the plot’s ultimate narrating framework, a sort of institutional memory serving as recording angel. Instead of the all-knowing, somewhat condescending voice of The Naïve and Sentimental Lover, this narration is brisk and brusque. It defends Smiley against those in the intelligence community who, through shortsightedness or malice, misjudged his decisions. It has been laid at Smiley’s door more than once since the curtain was rung down on the Dolphin case that now was the moment when George should have gone back to Sam Collins and hit him hard and straight just where it hurt. George could have cut a lot of corners that way, say the knowing; he could have saved vital time. They are talking simplistic nonsense. He echoes Wilkie Collins too. For mystery, never far from Dickens’ concern, is central to Collins and le Carré. Sustaining the reader’s interest through mystery seems not as important for our highbrow novelists now; it’s the province of “genre fiction.” But many of the canonical works of fiction and drama turn on secrets that are hinted at, then dramatically exposed (not only Oedipus and Hamlet but works by Henry James, Ibsen, Conrad, O’Neill, Faulkner). On the first page of Crime and Punishment, Raskolnikov thinks, “Why am I going there now? Am I capable of that? Is that serious?” The question of that that keeps us reading. You can argue that the modernist novel, with its fascination with time-juggling and stream of consciousness, found a sort of equivalent for the secrets, deceptions, and puzzles that drive classic tales. In any event, during the first decade of le Carré’s career, he began to explore the ways in which embedded stories can blossom into mysteries. In my original entry, I didn’t straighten out the plot of Tinker Tailor, but now, as the film nears the end of its theatrical run, I’ll tell the novel’s tale straight. Skip if you don’t want it all ironed out. Bill Haydon, working for British intelligence, is in the pay of Moscow Centre and its head, Karla. He has been passing information to the Russians for years, but Control, the head of the Circus, is starting to get suspicious. He believes that one of his five top men is a mole. Karla entices Control into sending an agent, Jim Prideaux, to meet a Czech general supposedly going to defect. This leads to a spectacular failure—Prideaux is shot and captured—and allows Karla to install an ambitious dunce, Percy Alleline, in Control’s position. Haydon is the best and the brightest, the flower of English manhood. Suave, easygoing, with an Oxbridge artistic flair, he is as debonair as Smiley is brooding and inscrutable. Haydon has strained his friendship with Smiley by conducting a brief affair with Smiley’s wife Ann, but that episode was initiated by Karla to make Smiley reluctant to suspect Bill of bigger crimes. Haydon has already tempted Percy with the promise of a double agent, a cultural attaché in London called Polyakov. Through Polyakov Karla feeds the Circus trivia, mixed with bits of good information, to the gratification of Alleline’s inner circle—Haydon, Roy Bland, and Toby Esterhase—as well as Oliver Lacon and the Minister overseeing the bureaucracy. And the Americans approve. Upon Control’s forced retirement, his team is abandoned and he dies a short time later. A permanently damaged Jim Prideaux is brought back to a new life as French teacher at a minor boy’s school. Smiley retires, while his wife Ann leaves to take up a string of love affairs. But when a raffish field agent, Ricki Tarr, reports on good authority that there is a mole at the very top of the Circus, Lacon asks Smiley to investigate sub rosa. Smiley installs himself in a shabby hotel and with the help of a youngish colleague, Peter Guillam, and an old friend, Inspector Mendel, he starts patiently scouring the records. Following in Control’s footsteps, Smiley discovers disparities, missing documents, and incompatible testimony. Eventually he is able to pressure Toby into revealing the location of the safe house where Alleline’s cadre meets Polyakov. By inducing Tarr to send a message galvanizing the Circus’ top brass, Smiley forces the traitor to hurry to meet Polyakov at their usual place. There Smiley, Guillam, and Mendel record Bill Haydon’s incriminating conversation and play it back to the embarrassment of the inner circle. There remains a long epilogue, in which Bill, in detention, confides in Smiley and seems to have no regrets about sending his closest friend Jim Prideaux into a trap and months of torture. Jim has discovered the treachery of his dearest friend and, sneaking into the compound, kills Haydon. While Smiley, now occupying Control’s seat of power, goes to the countryside for a possible reunion with Ann, Jim returns to his school, the object of the boys’ adoration but also a morose, haunted man. I’ve tried to synopsize the action as a thread, in Shklovsky’s sense, but I can’t do justice to the novel’s exfoliating plotlines. We’ve seen that a detective story basically presents the sleuth going from person to person, asking questions and getting information. Since Smiley is the protagonist, much of what I’ve traced has to be discovered through testimony or flashbacks. As Shklovsky remarks, any mystery in a plot involves some play with time, either ellipsis (what happens in the gap?) or rearranged order (hiding crucial causes) or a late point of attack (so that we must go back to reconstruct why things are as they are). But your straight-line Q & A investigation can be pretty plodding. Check for yourself by trying to read one of the “classic” detective stories by S. S. Van Dine. Forced to present official reports and characters’ recollections, le Carré skillfully expands those into robust, extensive stories of their own, filled out with characterization, detail, and atmosphere. The recording-angel narrator moves easily from reporting the interrogations to summarizing past action and then to full-blown scenes rendered from the viewpoint of the witnesses. As in the later books of the trilogy, le Carré’s point of entry is oblique. Instead of starting with Smiley, principal investigator, it starts with Jim Prideaux’s enigmatic arrival at the boys’ school, and even that is presented at one remove, through the vantage point of Bill Roach, aka Jumbo, a hapless “new boy” at the school. Only after that do we meet Smiley, hailed by the obnoxious gossip Roddy Martindale (a convenient expository device) who chats about the usurpation at the Circus. Soon Smiley is summoned to Lacon’s home, where he and Peter learn Ricki Tarr’s story of spying in Hong Kong and falling in love with Irina, the wife of a KGB spy. It’s she that tells him of the mole in the Circus. Tarr’s tale is the first embedded story, running four chapters. Once Smiley takes the assignment, relatively little happens in the present. His investigation carries him to his old Russia expert, Connie Sachs, and she recounts another block of information, about how her suspicions of Polyakov led her to be sacked from the Circus. Once Smiley is back at his hotel, he starts his reading, and for five chapters we get a big chunk of the past, including Smiley’s discovery of Bill’s affair with Ann. Smiley’s homework is interrupted by a suspenseful string of scenes involving Peter’s smuggling crucial files out of the Circus. Another embedded story soon follows: Over dinner Smiley tells Peter of his only meeting with Karla, many years before. Then, pursuing yet another clue, Smiley questions Sam Collins, the man on Circus duty the night Jim was ambushed. As in any good detective story, Bill Haydon seems to have an alibi (he heard the news at his club) and acts resolutely un-guilty, bursting into the Circus to take command and demand the return of his old pal Jim. Sam’s embedded story to Smiley is followed by others, from the man who drove Jim into Czechoslovakia and from Jerry Westerby, who heard rumors that the military were waiting for Prideaux. Getting ever closer to the fateful incident that set the whole shuddering machine into motion, Smiley finally hears Jim’s own version of what happened to him that night and in the months afterward. After so many extended stories—recounted by witnesses, filtered through hearsay, written up in bureaucratic files, commented upon by the recording angel—the plot launches into forward motion. Smiley and his colleagues set their trap, and there’s a suspenseful set-piece spanning two chapters. Le Carré alternates among Tarr in Paris, Mendel watching affairs at the Circus, and Smiley waiting in the safe house to trap the traitor. There follows an equally crosscut epilogue, with Bill and Smiley’s confrontations alternating with vignettes of other characters—including a young woman, introduced for the first time, who seems to have borne a child by Bill. The book concludes with Smiley, waiting to meet Ann and meditating on what drove Bill. In adapting a novel for the screen there is a natural temptation to dramatize the information supplied by narrative description in the original text by turning it into dialogue, but this is generally to be resisted. Where possible it should be translated into action, gesture, imagery. Much of it can be dispensed with altogether. Imagine trying to adapt this monster! Respecting the novel’s construction would demand a cascade of flashbacks, long tales framed by Smiley’s investigation. The seven-installment BBC series, scripted by Arthur Hopwood, took the simpler option of starting with a scene that is presented very late in the novel, in Jim’s embedded story told to Smiley. The series opens with Control summoning Jim and sending him off to Czechoslovakia; Jim is shot and Control is cast out. Clarifying the string of events this way, and giving us a decent action scene early on, has its cost: Smiley doesn’t enter the plot for nearly 23 minutes. Yet this construction does obliquely retain the portmanteau quality of the novel’s concept, in which sustained blocks of action are allowed to stretch and breathe. Soon, as in the novel, the TV series gives us Ricki Tarr’s story of his affair with Irina, presented as a discrete flashback. Then Smiley’s trawl through the files is supplemented by his visits to Connie and others. Sometimes their recollections are dramatized in flashbacks, other times we simply watch them tell Smiley of them. Fortunately for the viewer, there are also scenes of Smiley bringing Peter up to date, and briefing Lacon on current discoveries. Because the BBC series was broadcast in weekly episodes, this sort of backtracking was necessary. And since Hopcraft had several hours to fill, the plotting could be somewhat spacious. Nonetheless, the book’s oscillating time scheme was somewhat flattened out, and the block construction—main thread interrupted by inset stories—was compressed. The inset tales didn’t expand to their novelistic dimensions. The Tinker Tailor film, of course, had to be much more squeezed down. I mentioned in the earlier entry that the screenwriters compared their structure to a mosaic, and I followed this out in my discussion of how the narration was elliptical and fragmentary, leaving out redundancies that are usually required in popular film. Many scenes are both spacious and laconic. The rhythm is slow, and we’re given time to see and hear everything; but that “everything” might be only a voice dimly overheard, or a doorbell, or an image that gives one piece of information. Take an instance I didn’t pick out in the original post. In order to steal a file, Peter Guillam has arranged for Mendel to call him, pretending to be a garage mechanic. The call provides a pretext for Guillam’s retrieving his bag from the security officer, so he can slip the file inside. George Formby’s music-hall tune “Mr. Wu’s a Window Cleaner Now” is playing on the garage radio. It’s carried down the phone line to the call-screener at the Circus, who murmurs along with it as the call is recorded. After the tense meeting with the Circus cadre, Guillam has apparently sneaked the file out. But on the staircase an offscreen voice softly sings “Mr. Wu” before we see the source, not Guillam but Roy Bland. He descends slightly ahead of Guillam. Guillam follows right behind, pausing and looking off nervously as Bland passes through the foreground. The empty stretch of the staircase shot allows us to think that it’s Guillam offscreen, humming the tune he heard on the line, so it’s a surprise when Bland appears. We realize that he must have heard the call, or the recording. Another film would have cut away during Guillam’s maneuver to show Bland and his colleagues listening to Peter’s fake conversation. That would have dialed up the suspense: Will they detect the trick? Instead, showing the lady on the phone lets us know that the call is being recorded. Only retrospectively—and by a single piece of information that slips by—do we realize that Bland has heard the conversation. Guillam is being watched closely. There’s a meta-message here too: By humming the tune, Bland lets Guillam know he’s overheard the call. Bland’s casual feint fits with the intimidation of Guillam that began when he was called into Percy’s meeting. In all, the moment’s oblique, ricocheting transmission of story information could easily be missed. (In the book, it’s Bill who waylays Guillam and asks if he’s seeing Smiley. “Guillam’s world, which was showing signs till then of steadying to a sensible pace, plunged violently.”) The film’s script and direction have followed David Lodge’s suggestion of translating Peter’s sudden panic into images and sounds, but more laconic ones than we usually find. More broadly, the film’s stinginess about supplying information extends to its protagonist. As I suggested in the first post, Smiley doesn’t just solve mysteries—he is one. What does he want? Oldman’s dry, impassive performance bottles the shrewdness, sternness, and pain that Guinness let leak out in the series. It still seems to me that the film’s Smiley is playing a waiting game; even the “Aha!” moment near the climax, when he seems to have hit upon something, proves to be obscure. After the montage parades the suspects and shows the shifting train tracks outside Smiley’s dingy hotel, the narration doesn’t present the classic giveaway clue or blinding insight. Immediately we see Smiley, by force of will, bullying his superiors and Toby into giving him the information he needs to trap the mole . . . whose identity isn’t pinned down until the ambush. Smiley’s emotion bursts forth only once more, in his confrontation in Haydon’s cell. After a slight confirmatory smile (Prideaux, Smiley surmises, “knew deep down it was you all along”), Smiley asks if Karla ever considered letting Bill take over Control’s post. Smiley exhales, the burst of energy gone, and turns slightly aside. Smiley’s outburst here is his most vehement utterance in the movie. By the epilogue, Smiley, still unsmiling, has assumed his place as Control’s successor. You have to let go of the idea of explaining it all to the audience. You have to make it so complex that the audience understands that they can’t understand all of it. . . . We had to make it trustworthy and credible but also so complex that you couldn’t penetrate it. . . but not so incomprehensible that it put people off. More than most plot types, I think, a mystery story lures us into analysis. Think of the endless fan probes into Memento, Primer, Donnie Darko, and the like. The secrets in the action, and the roundabout tactics of recounting it, invite us to think about narrative technique more abstractly than we usually do. We’re encouraged to study how we’ve been misled. Analysis is a bit like detective work, but also like academic research. The analyst has a lot in common with Smiley and his patient burrowing into the files. He is, in the books, an amateur philologist and a scholar of German poetry. I agree that what they’ve done with the film is subtract most of the redundancy, with bits of information offered up only once. If you missed it, you missed it. I was surprised when Smiley actually told Ricki Tarr that he missed the chip in the door; that seemed like the movie was taking it uncharacteristically easy on the audience for a moment. It was kind of thrilling to see a film that trusts its audience to keep up with it the way this one does. I wonder if they might have initially stripped more info out and then put some back in during the editing process. . . . The other thing that has struck me is how very legible the film is when you see it a second time. Most everything does indeed seem to be there, in frame, but the audience isn’t cued to be looking for certain things. Ann does have some slight reaction to Bill Haydon when he sits down at the party, if I remember correctly (something cues Smiley to turn and look at him). And it’s clear why Bland offers to accompany Guillam to lunch. I guess Smiley’s eureka moment is a little bit of a leap, but otherwise, it’s all there. And here’s Ben Slater, a long-time le Carré admirer. I read the screenplay, officially online as part of Focus’s awards campaign (http://focusawards2011.com/workspace/ttss-screenplay.pdf) , and it’s fascinating how much of the adaptation was reworked and restructured in production. The film was intended to open ‘cold’ with Prideaux’s mission. His meeting with Control – now the opening sequence – wasn’t till much later. The abortive mission and the Christmas party were intended to only be returned to once each, and yielded most of their secrets (Karla’s presence/Bill and Ann) on the first go-round. There are myriad tiny and fairly dramatic changes – in the script Ricki Tarr’s first appearance is much more impactful, the killing of Bill is very different, etc. Some of these are changes Alfredson must have made during filming, others suggest a great deal of time spent re-arranging and re-sculpting the fragments of the plot in editing – trying to make the story flow as elegantly as possible. I imagine this was tough! It’s impossible to watch the film without running the novel and the TV series alongside it, and it struggles to compete in terms of narrative and character, but the real triumph is arguably the ambience of broken England it evokes – cigarettes, whiskey, bad burgers, bad skin and failed lives. The most basic conviction of every novelist from Lady Murasaki on . . . is that things are not as they appear. My arguments from Victor Shklovsky come from various essays in Theory of Prose, trans. Benjamin Sher (Dalkey Archive, 1991); the epigraph is from the essay “Sherlock Holmes and the Mystery Story,” 110-111. The David Lodge epigraph is from his “Novel, Screenplay, Stage Play: Three Ways of Telling a Story,” in Lodge, The Practice of Writing (Penguin, 1997), 215. The Jane Smalley quotation is in her 13 Ways of Looking at the Novel (Anchor, 2006), 49. For more thoughts from editor Dino Jonsäter, go to “Cutting Tinker Tailor Soldier Spy” on Creative Cow. I’ve signaled before the marvelous two-part interview with le Carré for the CBC, but why not do it again? Since writing the last piece I also discovered a helpful interview with Tomas Alfredson and Gary Oldman at Film School Rejects. I have other notes on the Hong Kong atmosphere of The Honourable Schoolboy here. 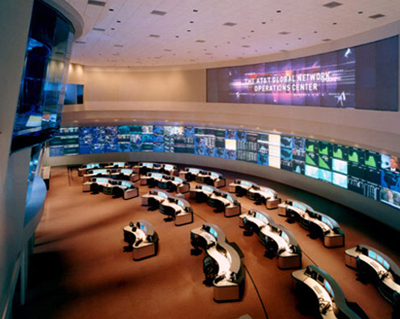 A video-wall display in the Christie Network Operations Center, Cypress, California. You’re in a multiplex. The pre-show attractions are large, loud promotions for TV shows, pop music, and star careers, interspersed with ads for men’s cologne and local pet-grooming facilities. Then comes the theatre chain itself telling you to hush up, turn off anything that emits light or sound, take your feet off the seats in front of you, and buy some popcorn. Next comes a barrage of trailers. Sooner or later the movie starts. If you look back at the projection booth, will you see another human being? Not necessarily. It’s possible that everything that happens in your theatre is automated. Now imagine another space, a large room with ranks of work stations. A couple of dozen people sit before their monitors, facing a video wall. From a room like this in Omaha, Nebraska, or in Cypress, California, or in Liège, Belgium, or in Shenzhen, China, these workers can remotely track thousands of theatre screens, including yours. It’s another consequence of the emergence of digital projection in our movie theatres. 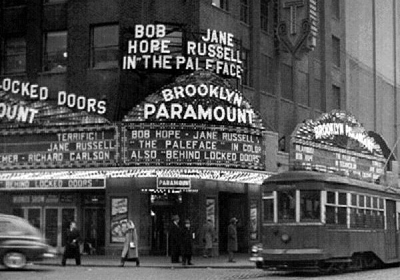 Brooklyn Paramount Theatre, 1948, from the splendor that is Cinema Treasures. One of the many lessons you learn from Douglas Gomery’s magisterial history of the Hollywood studio system is straightforward. For about a hundred years, film producers and distributors have sought to control exhibition. The advantages are obvious. Controlling exhibition keeps competitors off screens, it yields more or less assured revenues, and it allows vast economies of scale. If you can count on 2000-4000 screens playing your movie, as is common for Hollywood releases today, you can budget your production accordingly. The studios didn’t own most of America’s theatres, just the most profitable ones. The thousands of independent houses and chains were subjected to studio control in more indirect ways. The studios forced the independents to book films in batches (“blocks”). To get prime releases, the exhibitors had to take weaker titles. Likewise, the independents had to bid for upcoming releases without being able to see them. The structure of the market was another strategy of control. Adolph Zukor pioneered the system of runs, zones, and clearances. If people wanted to see a new release immediately, they had to pay top dollar at a first-run theatre. After a certain interval, the clearance, the movie would play a second run theatre in another territory at a lower price, and so on down the food chain of movie houses. Technology was another strategy of control. The 35mm film standard wasn’t proprietary, but the sound systems that the studios adopted in the late 1920s were. Of the dozens of systems, only two became standardized: Western Electric and RCA. In a process similar to what’s happening today, theatres were forced to install one system or the other. The thousands of screens that couldn’t afford the new technology went dark. This system worked to the Big Five’s benefit until 1948, when the Supreme Court declared Hollywood’s vertical integration monopolistic. The studios chose the wisest way to break up, given the slump in admissions: They divested themselves of their theatres and concentrated on production and distribution. (The process took several years in some cases, and there often remained close unofficial ties between the Majors and their former circuits.) In addition, block-booking and blind bidding were outlawed, so some market factors became more favorable to exhibitors. The postwar studios occasionally tried to remake exhibition through new technology. CinemaScope, designed by 20th Century-Fox, sought to become the industry standard for widescreen presentation. Although there was considerable take-up, it had competition from other systems (notably Paramount’s VistaVision) and exhibitors were able to wring concessions from Fox. Centrally, exhibitors were reluctant to install magnetic stereo playback, and so Fox had to compromise by producing prints that could play on optical sound systems as well. Similarly, while various 70mm formats were tried, none became obligatory for exhibitors, since films released in 70 were also released in 35, if only in later runs. Of course Hollywood still had a desirable product and could charge dearly for it, so stiff contracts for revenue returns gave studios considerable power. In the 1970s, the Majors (which no longer included RKO and had expanded to include Disney, Columbia, and Universal) found another way to use market dynamics to control exhibition. To publicize Jaws (1975), Universal launched massive television advertising and avoided the “platforming” or “exclusive engagement” practice. Studio chief Lew Wasserman opted for “saturation booking,” releasing Jaws on over 400 screens simultaneously. A month later it expanded to over 600. The growth of the blockbuster, nurtured by Star Wars, Superman, and other huge hits, encouraged theatre chains to build multiplexes. The distributors could then blanket screens with their product. Exhibitors could realize economies of scale by holding over some movies for months while rotating regular releases through other screens. With the arrival of cable, satellite transmission, and home video, studios were able to maintain tiers of price discrimination. The theatrical opening became the loss-leader, making less revenues but establishing buzz for the ancillary market. Theatrical runs were shortened considerably, but the “windows” of video distribution became the equivalent of second- and later runs. A movie becomes available on Pay Per View, then VOD and/or DVD, then premium cable, and so on. The windows’ length and ordering have changed over the years, but throughout, by carving up the market by price discrimination the studios continued to rule exhibition patterns. My account makes recent history too neat, with studios apparently steamrollering unprotesting exhibitors. In fact, exhibitors have responded to some pressures by dragging their feet or pushing back. Better sound systems took some years to penetrate the market. Some big theatres refused to play Star Wars Episode I: The Phantom Menace because of onerous terms, including a minimum guarantee and a commitment to a lengthy run in a ‘plex’s biggest auditorium. More recently, studios’ efforts to shorten windows and release films sooner on DVD or on VOD have sparked resistance. Studios have periodically tried to become vertically integrated again. There were some attempts in the 1980s to run theatre circuits, but only Viacom has found success owning both Paramount and the National Amusements chain. Today, technology is providing a more effective lever–or rather a crowbar. Digital projection furnishes the most thoroughgoing opportunity for studio control over exhibition since the coming of sound, and perhaps since the days when the Majors owned movie houses. Christie Network Operations Center, Cypress, California. My first entry in this series considered the power of setting standards, something Hollywood has been good at for decades. In 2005 the Majors established the technical specifications for the Digital Cinema Initiatives. As has happened throughout history, they had the input from the powerful manufacturers, service companies, and professional associations, like the SMPTE and the American Society of Cinematographers. Once the standards were set, the projection and service suppliers could move forward with appropriate equipment. The conversion is expensive, so exhibitors have been offered the option of signing up for a Virtual Print Fee. This is a partial subsidy from the major companies that is passed through an “integrator,” a third-party company that attends to acquiring the equipment, installing it, and monitoring payback. A decade ago, over a dozen significant US theatre chains filed for bankruptcy protection, so costs are constantly on exhibitors’ minds. Digital projection offered multiplex operators the opportunity to cut staff. Screening film prints is somewhat technical, and it relies on mechanical skills that are growing rare. So anything the manager can do to simplify running the show is welcome. Movies on digital files filled the bill. A film projectionist, represented by what was once one of the more powerful unions around, is expensive. Teenage labor is not. Digital works for the fresh-faced novice. Once the film comes in on a hard drive, it’s not terribly hard to set up a show. Disney has made a couple of remarkable instructional films (here and here) for the new projector operator Jimmy, who wears the requisite Bob & Ted apparel. In the old days, Walt would have given us a cartoon, and Goofy would have been the star. Jimmy loads the movies, and he or the manager sets up the programs. Once the features, the trailers, and the ads are on the servers or the library system, the theatre manager can program every screen. From a computer in the manager’s office, or almost anywhere, he or she can build each auditorium’s playlist by dragging and dropping. If the arrangements with the distributor permit, the files can be migrated from screen to screen. Even under these conditions, though, you need minimal maintenance. Projector lamps must be changed, for instance. The installers or a local expert can supply routine maintenance, but sometimes there are problems. An encrypted file can’t be opened, or it’s corrupted, or the show mysteriously stops. Very likely Jimmy, even consulting his manual, can’t fix the problem. 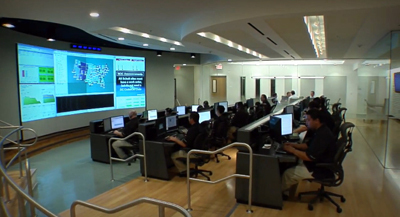 Network Operations Centers, also known as Data Centers, are part of broader Information Technology management. They’re used whenever a business or government agency has a network that needs 24/7 monitoring. All Fortune 1000 companies have NOCs, and probably have mirror backups of them scattered around the world. NOCs coordinate railway systems, military systems, banking, and police and fire departments. Amazon has a NOC in Seattle, Wal-Mart has one in Bentonville, Arkansas, and AT&T has a monstrous one in Bedminster, New Jersey (below). There’s a nice gallery of NOCs here. Don’t confuse NOCs with call centers or help lines. NOCs are handling and storing vast streams of data from computers, cameras, and other inputs. The goal is keeping track of things pertinent to the business or agency. But of course even large staffs can’t do this simply by eyeballing the flood of data. Instead, the software is set to notice anomalies and to call them to the attention of the humans. So if a police camera outside a Tube stop in London picks up a pattern of unusual activity, say three men running purposefully toward a woman, that information is pulled out of the stream and sent to an operator for inspection. Once film theatres became digital, they acquired the ability to connect to NOCs via the Web. An owner who funded the purchase of the DCI-compliant equipment might well choose to pay a NOC to provide oversight and help. Exhibitors who sign up for a Virtual Print Fee program are required to sign up for a NOC. NOC services may be supplied by the equipment manufacturer (Sony, Christie’s, Barco, GDC et al.) or by the installer, such as Ballantyne Strong (Omaha) or Film-Tech Cinema Systems (Plano, Texas). An integrator may also offer NOC services, as Cinedigm does in the US and XDC does in Europe. By the standards of giants like AT&T, a theatre-monitoring NOC tends to be fairly small, as my pictures indicate. Still, the purpose is the same. Each projector/ server combination and theatre-management system (essentially a master server) is connected via the internet to the NOC. The NOC monitors the state of the system, so that, for instance, it can keep track of lamp life, parts conditions, net connectivity, and the like. The software can send alerts to the theatre management for upcoming maintenance and can do troubleshooting. It’s also trained to notice problems—glitches in playback, lights going on, dropped subtitles, or whatever. Anomalies are called to the attention of the specialists at the work stations. The projection area of the Studio Movie Grill City Centre, Houston, announced as the world’s first completely automated booth. Now Jimmy and his manager have substantial support, but in turn they’ve shared a lot of information with the NOC. In order to collect the Virtual Print Fee, the exhibitor must play the studio’s film on a contractual basis—for a certain period, a certain number of times per day, and so on. In earlier times, a dodgy exhibitor might run a film more frequently than was reported back to the distributor, with the exhibitor pocketing the difference. Or an exhibitor might trim shows of a poorly performing title, substituting something more popular and depriving the weak film of playing slots and box-office payback. In the pre-digital days, distributors sent out “checkers,” staff disguised as ordinary moviegoers, to see that theatres were running films according to the booking. All of the NOCs notify the studios about the performance of the systems. Uptime is critical or VPFs will not be paid. Exhibitors cannot miss more than a certain number of allotted shows and still receive their checks. . . . All NOCs provide the studios with access to the playback logs to ensure the movies booked are actually played. At a minimum, then, the performance information forces the exhibitor to abide by the booking contract. But it also means that even with full knowledge on the part of both exhibitor and distributor, the advantage lies with the distributor. For example, if an exhibitor wants to play a film from outside the Majors, even if that film is available on a DCI-compliant file, that distributor has to pay a VPF. From the standpoint of the studios and the supply companies, he who pays the piper calls the tune: A DCI-compliant projector shouldn’t be used by free riders who didn’t participate in the DCI. Why should the Big Six establish the standard and fund the purchase and installation of the gear in order to play a competitor’s film? If the exhibitor dares to proceed without the VPF and uses the equipment to show unauthorized product, that information flows back to the NOC. Consider as well the practice of “splitting.” Smaller theatres and art houses often adopt the multiplex tactic of offering many titles, but for them that entails showing two or more films on the same screen in a given day. Often splitting is done with the advance permission of the distributor, but sometimes it’s done ad hoc and reported after the fact (unlike the dodgy practice of show-shuffling I mentioned above). But VPF conditions may forbid splitting altogether. And if the exhibitor is obliged to do it, as when one movie file fails to run and another must replace it, the NOC will flag it. In a highly automated environment, things can proceed blindly. There’s a story (not apocryphal, I think) about an early automated theatre system here in Madison, Wisconsin. During the 1970s, a snowstorm paralyzed the town, but someone at a theatre had left the system on. Even though the theatre was closed (and no one could get to it), the show went on: lights up, lights down, curtain parts, film runs, film halts, lights up, film rewinds…. More vaguely, some exhibitors worry about the NOC as a policing or surveillance operation. No one can object to a mechanism that enforces contracts, but film screenings have long had a certain fluidity, especially in the art-house realm. On-the-fly compromises and flexible arrangements emerged from negotiations among managers, programmers, bookers, and distribution staff. People knew one another and made allowances for specific circumstances. When so much of scheduling and operation is transferred to servers, playlists, and NOCs, human contact is likely to wane. The projectionist isn’t the only ghost haunting the multiplex. 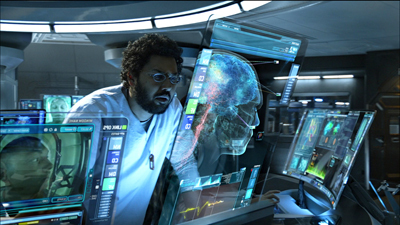 The studios innovated technology and had the power to set standards and restructure the flow of product. The multiplex exhibitors wanted to cut costs and simplify presentation. This meshing of interests allowed Hollywood studios to control exhibition to a new degree. Who wants to own theatres anyway? They entangle you in mortgages and real estate crises, and they have the awkward habit of going into bankruptcy. In addition, the Majors could win over local exhibitors by upcharging for 3D and by supplying ad packages that generate more income. Today if you control the files, the encryption, and the network, you control the show. What’s left for the managers? Well, there’s selling popcorn. This is the seventh in a series of entries on the conversion to digital projection in cinemas. Thanks to Douglas Gomery, whose work on the American film industry has guided my thinking for the years going back to our teaching together at Madison in 1973. The place to start is his superb book The Hollywood Studio System: A History, which is complemented by his Shared Pleasures: A History of Movie Presentation in the United States. I’m grateful as well to those exhibitors and service specialists willing to share information with me, as well as to Jenn Jennings, who is making a film about the digital transition, and Jim Cortada of IBM and the Irvington Way Institute. The Film-Tech Forum is an informative chatroom concerning projection and general film matters. Examples of NOCs in action have been provided in videos by Christie and XDC. In the latter, and true to European sophistication, our fashion-challenged Jimmy is replaced by a woman with bangs and a discreet nose ring. Yet like you and me, she likes a snack. Peter Rotsaert and Vico De Vocht examine a digital version of a silent film at the Brussels Cinematek. Today Dawson City, in the Yukon Territory of Canada, has fewer than two thousand people, but in the 1890s tens of thousands passed through in search of gold. Movies came along too, but the remoteness of the place made it the end of the line for most prints. Many were stored in the basement of the Carnegie Library. In 1929, an enterprising bank worker shifted them to an abandoned swimming pool. The stacks of films were covered with planks, and they were in turn covered by earth, so the films were buried in the permafrost. The surface became an ice hockey rink. In 1978, builders discovered the film cache. Sam Kula, then an archivist at the National Archives of Canada, stored the films temporarily in an ice house. The painstaking process of checking each reel began. Eventually the US Library of Congress was brought in because most of the 507 reels discovered were American. Among the finds were a Harold Lloyd short, a great deal of news footage, and a rich array of serials starring heroines of the 1910s. Wellington, New Zealand, was another terminus for American movies during the old days. In 2009, a film preservationist from the Academy of Motion Picture Arts and Sciences learned that the New Zealand Film Archive held a lode of Hollywood films. The collection, reviewed here, includes many Westerns and Christie comedies, along with John Ford’s supposedly lost Upstream (1927). The restored Upstream played in festivals and special screenings during 2010 and 2011. Five American archives have been involved in restoring the seventy-five titles selected for repatriation. 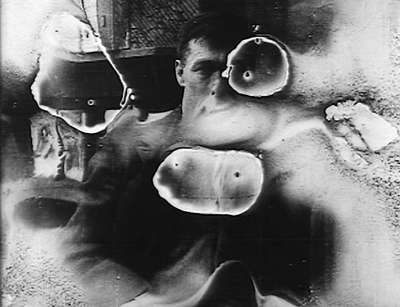 Nitrate decomposition; from Bill Morrison’s Decasia: The State of Decay (2004). Of the tens of thousands of feature films produced worldwide in the silent era, approximately ten per cent survive. The archives I’m speaking of are either public ones, like the Library of Congress, or privately supported ones like Eastman House and the Museum of Modern Art. These and hundreds of smaller archives are nonprofit institutions charged with protecting images and sounds we’ve deemed of cultural value. By contrast, a studio-based archive aims to maintain the firm’s investment in its property. 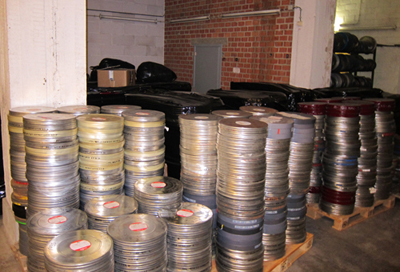 Often studios deposit films of historical importance at nonprofit archives; some countries require by law that copies of films circulated there be deposited in the national archive. Both sorts of archives have done excellent work, but I’ll be talking largely of the nonprofit ones, which often receive films by donation, deposit, purchase, or accident. Archivists distinguish between conserving and preserving. 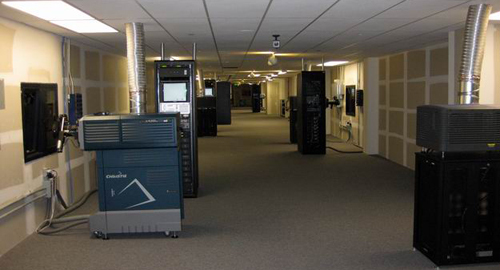 You conserve a film by taking it into the archive and storing it safely in temperature-and-humidity controlled vaults. You preserve it by cleaning and patching it, and if necessary transferring it to a more stable medium. Restoration, which is the archival task most visible to the film-loving public, goes further. It involves working to bring the film back to something like its original state. Before the 1970s, archives conserved and preserved, but seldom restored. Archivists at public institutions balanced two duties: keeping films safe for the future and screening them for the public and researchers. Like art museums, archives guarded treasures while putting some of them on display. Most often, archives preserved their material by making the best possible copies. A big part of the job was migrating films from one format to another. For example, some early American film companies copyrighted their product by submitting rolls of paper on which each frame of film had been printed. These “paper prints” had to be transferred, frame by frame, to motion-picture film. Likewise, films surviving only in rare formats, like 9.5mm, 22mm, and 28mm, had to be transferred to 35mm so they could be run on standard equipment. 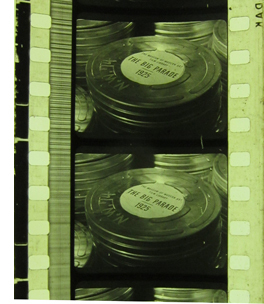 Tinted films on nitrate were reprinted on black and white safety film. 16mm films might be blown up to 35mm, and 35mm might be reduced to 16mm for circulation to schools, libraries, and film clubs. Most famously, thousands of films in archive collections exist on nitrate stock. That was the professional standard before 1950 or so, when the industry abandoned it. Not only did nitrate film have a habit of exploding or catching fire, but it tended to decompose. Experimental filmmakers have found a sinister beauty in ruined footage, but archivists organized for funding to help transfer their collections to acetate. Then archivists learned that some acetate prints degenerated into a vinegary, contagious vapor. So migration to a new, polyester-based stock became necessary. 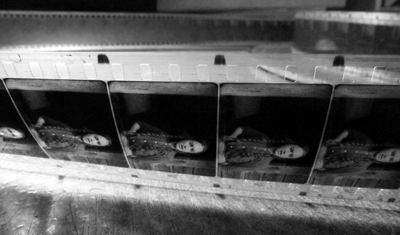 Preservation, simply keeping films alive in long-lasting formats, remained central to archives. 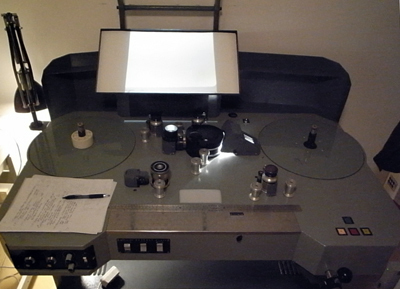 In the 1970s a number of archivists also began restoring films. For example, most silent feature films were released in tinted and toned prints, but many copies survived only in black-and white. Restorers, guided by surviving paper records, aimed to create prints that approximated the original color schemes. Restorers naturally faced decisions about what would count as an original. In 1989 there were six different versions of Mr. Smith Goes to Washington, running from 119 minutes to 132 minutes. In uncertain cases, records of running times and postproduction work helped identify what was missing. If the footage couldn’t be found, still photos or even a blank screen might cover the gaps, as in restorations of Greed and the 1954 A Star Is Born. A musical score helped researchers measure how much footage from the original Metropolis remained to be found. With the rise of cable television and home video, studios’ film libraries became more valuable. Ted Turner, owner of the MGM, Warner, and RKO libraries, was blamed for “colorizing” some classics for his cable channels, but at the same time he invested in restoring a great many of them. Other firms followed suit. Gone with the Wind and Disney perennials were reworked for cable and VHS release. The 1980s and 1990s became the great age of restorations. Audiences were reintroduced to Napoleon, Becky Sharp, Lawrence of Arabia, and Vertigo. Kevin Brownlow and David Gill, working with Thames Television, reissued silent classics, with new scores by Carl Davis. Most of the era’s restorations wound up on video platforms. Today Turner Classic Movies is our great display case for studio and off-Hollywood restorations; it’s the closest thing we have to a Citizen’s Film Library. At first, restoration was a photochemical affair. Every major archive employed experts in rephotography and lab work who knew how to optimize the look of a print. 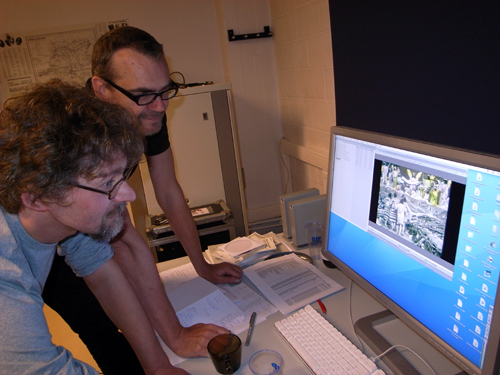 Archivists like Noël Desmet collected information about properties of old film stocks and tinting dyes. Faded films could be reprinted through filters that might bring back some of the old snap. The look of old films was much improved by wet-gate printing, which bathed the frames in a liquid that masked scratches on the base or emulsion. But not much could be done about the blotchy nitrate decay that might invade a scene, or the dirt and dust that earlier copies of the film bequeathed to the current one. And those films for which no original negative could be found, including Citizen Kane and Singin’ in the Rain, would always be seen as the shadow of a shadow—new copies pulled from earlier, perhaps shabby ones. The upside was that as long as you kept your source prints and your restorations on 35mm film stock in a cool, dry place, you had material that would last over 100 years. Some day you might find better tools for improving what you had. That day came fairly soon. 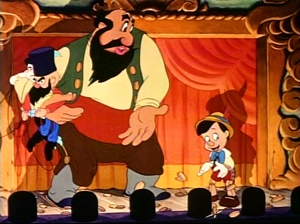 The Disney company had a steady income from theatrical and video re-releases of its animation classics, and a 1990 reissue of Fantasia employed some video-paint work to correct flaws in the frames. Snow White and the Seven Dwarfs was then given high-resolution treatment. Dust-busting and color adjustments were made frame by frame. Re-released in 1993, Snow White was the first feature to be restored digitally. Since then, digital fixups have become a standard method for archival restoration. Footage is scanned into a file at 2K or 4K resolution. Either manually or automatically, the software can correct for jumpy or shaky imagery, do dust-busting, erase scratches, and balance exposure, contrast, and other factors. It can interpolate image areas in order to correct damages in the frame, and it can add tinting or toning. The finished files may then be saved as files or scanned back onto film, as Snow White was. You can see an example from the newly restored Marcel Carné film, Children of Paradise (Les Enfants du paradis). Soon most restorations are likely to be finished and screened on digital formats, with virtually no 35mm prints circulating. Decay of digital imagery, from Creative Applications. The preservation of born-digital films is going to be the greatest challenge ever to face archivists. The new magical software has sometimes led to over-restoration. Grain has too often been polished out, creating a plastic sheen. Still, today no archivist can avoid using the new toolkit. The sadder story involves not restoration but conservation and preservation. A civilian might think: That’s simple. Just save film on film and digital on digital. But things are more complicated than that. Let’s start with a movie like The Girl with the Dragon Tattoo, which was shot with digital capture. After production and post-production, it was made available to theatres as both a Digital Cinema Package (that batch of files on a hard drive) and some 35mm prints. But there are several digital versions of the movie. Digital source material. The original sound and image “content” may be captured in specific formats, either tape-based or file-based. Those formats can vary a lot among themselves. The Girl with the Dragon Tattoo, for example, was shot with the Red One camera on the company’s proprietary format R3D. Other cameras don’t use that format. So the footage was converted to other sorts of files for viewing and postproduction work. Any major film nowadays is likely to use many digital video and audio formats. All these assets are usually stored in the distributor’s vaults. The Digital Source Master (DSM or DCM). This is the master copy of the finished film, somewhat comparable to a 35mm film negative. It can be in any format selected by the filmmakers. It’s the basis of the distribution master, the home video master, and a master version for archival storage. The Digital Cinema Distribution Master (DCDM), in formats determined by the Digital Cinema Initiatives. This is the finished film unencrypted and uncompressed, providing “content” at 2K and/or 4K resolution. Roughly speaking, this is the digital counterpart of a 35mm release print. The Digital Cinema Package (DCP). This is the film compressed and encrypted for theatrical playback. It’s roughly comparable to the delivery of a 35mm print on shipping reels. The Digital Cinema Distribution Master as played (DCDM*) Once the DCP files are opened and decompressed, they yield image and sound identical to what’s encoded on the DCDM. The DCDM*’s place in the system is somewhat parallel to the projection of a 35mm print from platters. Many studio films are housed in nonprofit archives too, and until recently those movies have been deposited and stored as analogue copies. But what will those institutions now keep? There are only three minimally acceptable formats: the uncompressed and unencrypted DCDM, the DCP, and a 35mm print. Suppose your film archive is lucky enough to receive both a DCP and a 35mm print of The Girl. First, how do you access the DCP files? A DCP is typically encrypted to block piracy. When The Girl played theatres digitally, each exhibitor was provided an alphanumeric password that would open the files for loading into the theatre’s server. By the time you the archivist get the files, that key may have expired or been lost. Without the key, the DCP is useless. Then there’s the matter of storage. The 35 print of The Girl can simply be passively conserved, following the motto, “Store and ignore.” But all digital material, no matter how minor, requires proactive preservation. The future for digital storage is constant migration. Archivists estimate the life of any digital platform to be less than ten years, sometimes less than five. All hard drives fail sooner or later, and they need to be run periodically to lubricate themselves. Tape degradation can be quite quick; one expert found that 40 % of tapes from digital intermediate houses had missing frames or corrupted data. Most of the tapes were only nine months old. Moreover, hardware and software are constantly changing. One archivist estimates that over one hundred video playback systems have come and gone over the last sixty years. Archives currently recognize over two dozen video formats and over a dozen audio ones. Periodically, then, the DCP files of The Girl will have to be checked for corruption and transferred to another tape or hard drive and eventually to another digital format. Such maintenance takes time; shifting a terabyte of data from one system to another may need at least three or four hours. Ideally, you’d want several copies for backup, and you’d want to store them in different locations. There are hundreds of other films like The Girl awaiting processing at major archives. About 600-900 feature films are produced in the US each year. Currently the world is producing about 5500 features per year. At some point, they will all originate in digital capture. Besides access and storage there’s the matter of cost. Storing 4K digital masters costs about 11 times as much as storing a film master. You can store the digital master for about $12,000 per year, while the film master averages about $1,100. How do the overall costs of digitizing mount up? Look at the situation in Europe. The EU countries produce about 1100 features and 1400 shorts per year. An EU archival commission, the Digital Agenda for European Film Heritage, estimates that to conserve one year’s output would require 5.8 PB (petabytes) of storage. In 2015, the costs of archiving that year’s output (without restoration) are projected to be between 1.5 million and 3 million euros. Beyond initial conservation, long-term preservation of that year’s output would consume, though migration and backing up, about 1900 PB and cost about 290 million euros. The access problem is soluble. Your archive could be given an unencrypted DCP of The Girl and then create its own key to prevent copying. Or the DCP could be assigned a generic key, perhaps for a specified time period, that will open the files in a secure milieu. They could then be migrated to a format under archive control. On the matter of software, archivists are working on establishing standard preservation file formats and codecs. To deal with the other problems, you’d have to press for increased budgets and personnel to cover the new duties that digital archiving creates. But the costs, including training personnel on ever-changing platforms, are of tidal-wave proportions. The methods we have for securely storing comprehensible digital data are highly labour-intensive. Humans are too slow and they cost too much. So why don’t you preserve The Girl’s files on film? Film is universally recognized as the most stable platform for moving-image material. Properly stored, a film print can last a hundred years or more. Maintaining a print, as we’ve seen, is cheaper than maintaining digital files. It’s significant that the archives of most of the major studios continue to transfer all their current features to film via color separations on polyester stock. Apart from the costs of making file-to-film transfer, which can amount to tens of thousands of dollars, the long-range problem is technology. The same forces that shoved out 35mm projection have made 35mm preservation much harder. The equipment for outputting digital files onto film will eventually cease to be available. With the rise of digital projection, demand for film stock plummeted. Eastman Kodak’s recent bankruptcy filing reflects the declining market for raw film, and even though Fuji promises to continue to make 35mm stock, it is likely to get more expensive. As David Hancock of IHS Screen Digest points out, the cost of silver, a necessary component of raw stock, is rising steeply after being low for many years. Sensing a niche market, Kodak has announced that it will provide a new emulsion favorable to archival preservation. But at the moment, laboratories that can process and print any film stock are closing. Not for nothing does Nicola Mazzanti, Director of the Royal Film Archive of Belgium, suggest that an archive should consider buying a lab, which is likely to be available at a low price. As a solution [digital migration to film] will only be viable as long as the analogue film ‘ecosystem’ (equipment, film stock, laboratories) exists. Instead of being a long-term solution, the risk is that it becomes a very short term one. In the long term it will make problems worse as it will increase the number of works that need to be digitised in the future. . . . At 25,000 euros to 100,000 euros per feature film, the going-back-to-film solution appears to be 20 to 80 times more expensive than digital preservation. Speaking very broadly, with 4K scans of color films you wind up in the neighborhood of 128 MB per frame. . . . Figure that a typical motion picture has about 160,000 frames, and you wind up with around 24 TB per film. And that’s just the raw data. Now you process it to do things like removing dust, tears, and other digital restoration work. Each of those develops additional data streams and data files. We’ve decided, based upon our previous experience, that it is best to save the initial scans as well as the final processed files for the long term. Now we are up to 48 TB per film. In our nitrate collection alone, we have well over 30,000 titles. 48 TB x 30,000 = 1,440,000 TB or 1.44 EB (exabytes) of data. I think that film-on-film projection will ultimately become the sole purview of archives and museums. Once you’ve found a way to conserve-preserve The Girl with the Dragon Tattoo, what if you want to show it tomorrow? Or ten years from now? Or fifty? If you have a DCP in good shape, and a projector that will show 2K/4K according to the Digital Cinema Initiative standard, you’re good to go. For now. But maybe not tomorrow. Once the projector/ server market has saturated and everybody has DCI-compliant equipment, equipment manufacturers and software designers have to keep innovating to sell new machines. Many observers expect the D-cinema standard to be recast in the next ten to fifteen years, and projectors may be redesigned sooner than that. Mazzanti anticipates that there will be 8K resolution, greater bit depths, faster frame rates, laser projection, new sound formats, and other advances. Already innovations are leapfrogging DCI standards: last month, a new generation of projectors was showcased. If you program your digital version of The Girl for its twenty-fifth anniversary in 2036, you will probably have to reformat it for whatever your projector can then play. So instead you hold on to your 35mm print. That will give you cachet, because within a decade all commercial cinemas will be digital, and, as Mike Pogorzelski mentions, only archives will show 35. But cachet takes cash. Archives, at least the major ones, will have to retain their 35mm inspection and projection gear, even though that will probably cease to be made and parts will be cannibalized. You’ll need vigilant, resourceful staff who know how to fix old machines. Moreover, with the scarcity of raw stock and the shuttering of laboratories, archives will be less likely to make screening copies of their holdings. Virtually every 35mm copy you the archivist hold, from Red Desert to a Bowery Boys movie, becomes irreplaceable, what Mazzanti calls a “unique master.” Then film archives will truly become film museums, custodians of extremely rare artifacts. At some point no one may risk running analog film, as the damage would be irreparable. In that worst-case scenario, archives will show digital copies, either derived from prints or supplied by whatever sources they can find (including, yes, Blu-ray or whatever comes after). One consequence may be the freezing of the canon. We’ll get more and better versions of old standbys like Metropolis and Napoleon, but less effort to retrieve lost or ignored items from scratch. New discoveries may simply be too expensive to maintain, especially if they lack the crowd-pleasing appeal of the most famous classics. They were concentrating on the benefits of the digital workflow, but weren’t thinking about what happens to their [digital] masters. They’re structured to make their movie, get it in front of an audience, and then move onto the next one. Still more unaware, I imagine, are all the people making amateur footage. 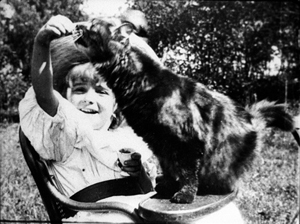 Lumière’s La Petite fille et son chat was made in 1900 and is still around to charm us. 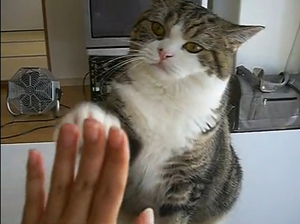 The YouTube adventures of Maru, a LOLcat superstar, aren’t likely to last so long. The museum is not the worst place to end up, quite the opposite. Even in the most “unthinking” museum, the strange material shape of the artifact reminds visitors of alternative forms of social and cultural organisation and, therefore, that the currently dominant forms and norms are not the only ones imaginable: forms and norms are never “natural”, but historical and man-made. . . . Today, the expression ‘You’re history!’ is meant as an insult, not as a factual statement. Isn’t it essential, therefore, to side with those so insulted in order to keep alive any notion of historicity? I’m not equipped to weigh in on this professional dispute. For my part, I’m hoping that this blog’s readership, mostly curious cinephiles, will sense the enormity of what archives face. Most discussions of The Digital Revolution have concentrated on production, and no doubt that’s important. At the high end of studio-supported projects, though, 35mm is still widely used. But whether shot on film or digitally, as long as movies were distributed and screened on photochemical prints, we had, at least in principle, long-term access to them. As someone who studies films from many periods and places, on prints whenever possible, I’m grateful that film on film was the norm throughout most of my career. Now it’s clear that the switchover to digital distribution and projection had a far more sweeping impact on film culture than almost anyone expected. It hastened the decline of the film manufacturers, who flourished when saturation booking and day-and-date release required thousands of prints. Digital projection helped push more filmmakers into digital capture, since it threatened to make 16mm and other small-gauge formats unshowable. It changed multiplexes, giving distributors and funders unprecedented oversight of screenings. It sacked projectionists, who were often bearers of practical wisdom and technical knowledge. It reconfigured theatre architecture. (Boothless projection is already here.) It forced small exhibitors to invest in expensive equipment. It threatened art house theatres that play unique roles in their communities. And it turned film archives into residual institutions that have to mop up after many cycles of media churn. The digital gold rush, along with fear of piracy, favored short-term solutions and proprietary, incompatible software and hardware. There were too many ephemeral video formats chasing the consumer and prosumer market, with little thought of their afterlives. The days of 8mm, super-8mm, 16mm, 35mm, and 65/70mm were simple by comparison. We’re left with a plethora of transitory standards that will be impossible to recover. Nonprofit archives will struggle to maintain collections with any thoroughness. Choosing what to save, always necessary, will now become crucial. Only a fraction of what we have can be conserved–not preserved, merely kept. If I found a reel of 35mm film in 500 years and didn’t know what it was, I could probably without too much trouble figure out a way to reverse engineer a projector. In any case, I can always look at the individual frames, even without a projector, and see what is there. If I find a cache of Blu-rays and DCPs in 500 years, what do I have? Plastic waste. How do you reverse-engineer those media? Impossible. Without an understanding of the software and the hardware, you have zip. No way to look at it, no way to know even if it has any information on it. This is the sixth entry in a series on the worldwide conversion to digital projection. Arne Nowak provides an excellent overview of how new exhibition technologies are affecting preservation in “Digital Cinema Technologies from the Archive’s Perspective,” AMIA Tech Review (October 2010). A brief but informative lecture by Mike Pogorzelski on the subject is here. He explains how the Pixar crew found that they couldn’t access their original files from Toy Story. See also Leo Enticknap’s article “Electronic Englightenment or the Digital Dark Age? Anticipating Film in an Age without Film,” which argues that digital changes create crucial new responsibilities for film archives. It’s available in Quarterly Review of Film and Video 26 (2009), 415-424. I took information about the digital capture of The Girl with the Dragon Tattoo from Jay Holben, “Cold Case,” American Cinematographer 93, 1 (January 2012), 34-36. Much of the information I’ve cited comes from two crucial reports from the Science and Technology Council of the Academy of Motion Picture Arts and Sciences, both available online. The first, published in 2007, is The Digital Dilemma: Strategic Issues in Archiving and Accessing Digital Motion Picture Materials. It concentrates on strategies for safeguarding studio archives, but much of the information about archival storage is relevant generally. The Digital Dilemma 2: Perspectives from Independent Filmmmakers, Documentarians, and Nonprofit Audiovisual Archives, was published earlier this year. I’m particularly grateful to Nicola Mazzanti of Brussels, who shared his ideas with me last summer and in correspondence afterward. I’ve drawn extensively on his “Goodbye, Dawson City, Goodbye,” in AMIA Tech Review (April 2011) and his PowerPoint presentation, “The Twin Black Hole: Key Findings and Proposals for the EU-Commissioned Study Digital Agenda for European Film Heritage,” EFG Conference, Bologna 30 June 2011. The final report of DAEFH is now available. If you think my assessment is glum, a little browsing in that report will make my entry look rosy. The quotation above is from p. 76. Thanks as well to Antti Alanen of the National Audiovisual Archive of Finland, Schawn Belston of the Twentieth Century Fox library, Thomas Christensen of the Danish Film Archive, Grover Crisp of Sony Pictures Entertainment, Jan-Christopher Horak of UCLA, Alexander Horwath of the Austrian Film Museum, Mike Pogorzelski of the Academy Film Archive, Jeff Roth of Focus Features, and Quentin Turnour of the National Film & Sound Archive of Australia. For a nice web lead, thanks to Paul Rayton and John Belton. 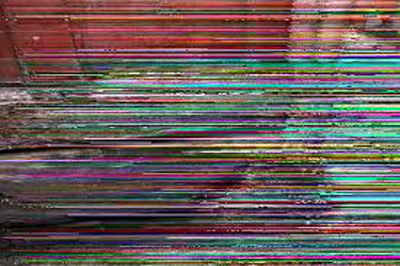 For more on the effects of digital archivery, see Jan-Christopher Horak, “The Gap between 1 and 0: Digital Video and the Omissions of Film History,” Spectator 27, 1 (Spring 2007), 29-41, from which my first Horak quotation comes; and Charlotte Crofts, “Digital Decay,” The Moving Image 8, 2 (Fall 2008), xiii-35. Several quotations I’ve embedded are from participants in “Film Preservation: A Critical Symposium,” ed. Jared Rapfogel and Andrew Lambert, Cineaste 36, 4 (Fall 2011). Additional comments can be found online here. Early premonitions of the problem of digital preservation came from science-fiction writer Bruce Sterling in his 2001 talk, “Digital Decay.” A later, still more pessimistic warning, is here. Another prescient early piece is also from 2001. Howard Besser’s “Digital Preservation of Moving Image Material?” appeared in The Moving Image 1, 2 (2001) and is available here. Sam Kula’s account of the Dawson City collection can be read in “Up from the Permafrost: The Dawson City Collection,” in This Film is Dangerous: A Celebration of Nitrate Film, ed. Roger Smither and Catherine A. Surowiec (Brussels: FIAF, 2002), 213-218. On the Paper Print Collection and its use in avant-garde cinema, see Gabriel M. Paletz, “Archives and Archivists Remade: The Paper Print Collection and The Film of Her,” The Moving Image 1, 1 (Spring 2001), 68-93. A helpful overview of changing archival practices is offered by Sarah Ziebell Mann in “The Evolution of American Moving Image Preservation: Defining the Preservation Landscape (1967-1977), The Moving Image 1, 2 (Fall 2001), 1-20. My quotation from Alexander Horwath comes from a manuscript version of his contribution to Film: Tacita Dean (London: Tate, 2011). On digital restoration, see Giovanna Fossati, From Grain to Pixel: The Archival Life of Film in Transition (Amsterdam University Press, 2009). Disney’s restorations of classics are discussed in David Heuring, “Disney’s Fantasia: Yesterday and Today,” American Cinematographer 72, 2 (February 1991), 54-65; Bob Fisher, “Off to Work We Go: The Digital Restoration of Snow White,” American Cinematographer 74, 9 (September 1993), 48-54; and Scott MacQueen, “Snow White and the Seven Dwarfs: Epic Animation Restored,” The Perfect Vision no. 22 , 26-31. PS 13 February 2012: Talk about your convergences. John Bailey’s always-interesting website takes up the same subject on the same day. And he has a further interview with Milt Shefter, whom I quote. Thanks to Stew Fyfe for the link. Even though I’ve been the voice of pessimism over these issues for more than a decade, I do see some possible positive outcomes (as in Chinese–crisis incorporates opportunity). One issue that I’ve spent a lot of time on over the past decade is getting filmmakers more involved in the preservation process–which not only eases the burden on archives, but also allows us to save not only rushes and early edits, and will allow us save a multitude of versions of a work with little extra overhead. Another opportunity is that the cost issue (which is much more of an infrastructure cost than of a per-film cost) may drive archives to be more cooperative with one another, with the financial burden forcing groups of archives to band together to share the cost of a digital archive. Thanks to Howard for corresponding. PPPS 15 February 2012: Another piece on the problems of digital preservation of 35mm, with comments by George Eastman House archivist Paolo Cherchi Usai. Sorry I didn’t know of it sooner for use in this post, but thanks to Kat Spring for the link. PPPPS 13 March 2012: I’ve recast the portions about the various digital versions of a film to correct my previous, mistaken description of the nature of the Digital Source Master. I’ve added as well a mention of the DCDM*, in order to better explain the parallels between digital versions and analog ones. Life is like a can of film: You never know what you’re gonna get.